I moved my somewhat lengthy post about the Raspberry Pi and realtime control of the Pololu Micro Maestro Servo controller to this page. I’ve also updated it since it was a little terse and some of the components you needed to run this were not specifically mentioned. 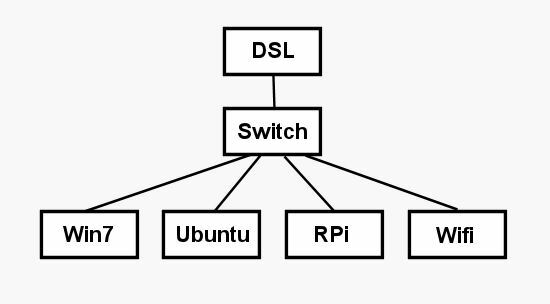 A very typical, minimalistic home network. The DSL modem does the DHCP and the switch is a simple eight port thing I got from a big box store. There are four devices on the network, a Win7 box, a Ubuntu PC, the Raspberry Pi and an old wireless router for Wifi. 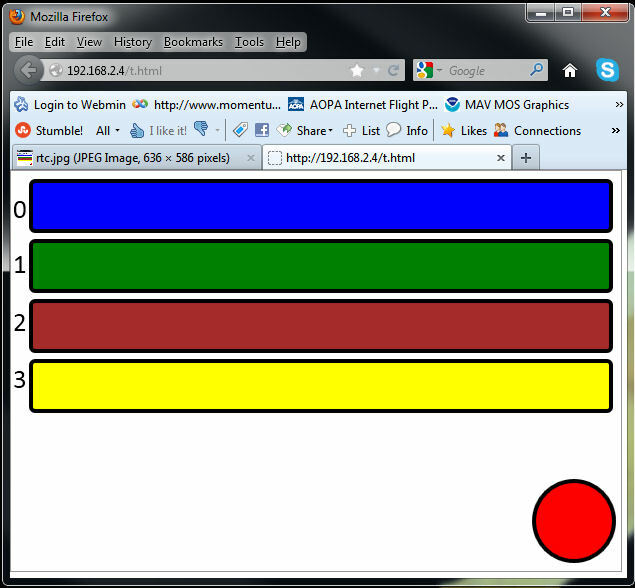 For the web server go here- Set up lighttpd web server. Both of these posts reference two really excellent tutorials by Simon the Pi Man. I encourage you to check out his site for other RPi goodies, he has some great stuff there. Here is the Tornado Home I did the manual installation. Ok. Armed with all that info, you should be able to use the following code to tie this all together and make it work. Essentially, after installing everything, you take the html file, the server.py file and the kineticJS.js file and place them in the /var/www folder. Then you run server.py which just enters an infinte loop looking for commands that come in. As mentioned before, this is a minimalistic bit of code that needs to be fleshed out to use in any sort of ‘production’ situation, but it’s enough to get the basics. 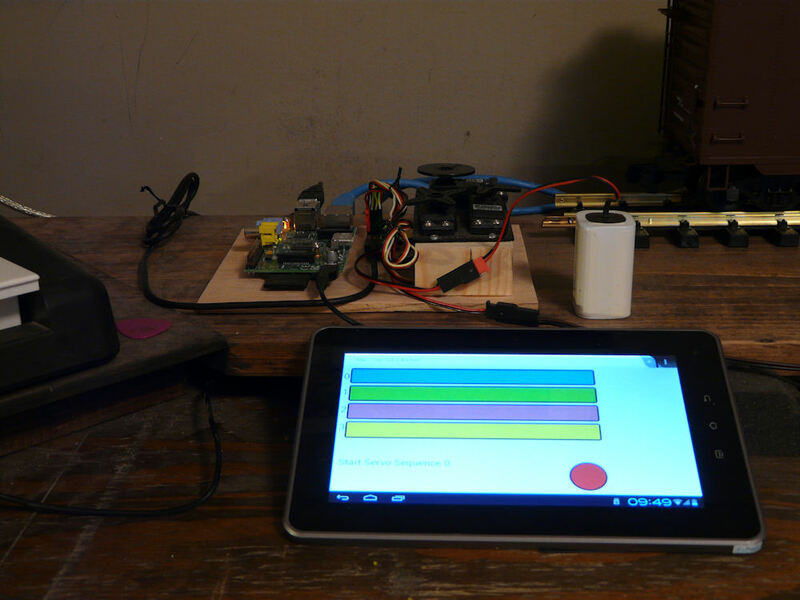 The data moves from the touch commands on the tablet to the Rpi via the web socket, then out to the pololu interface which sends the pulses to the servo. This is a screen shot from the PC, note that this html code won’t work on the PC as the color bars are triggered from the touch commands on the android screen, not mouse commands. You could modify this to work on the PC but I haven’t added that, you are welcome to add your own mods. As far as the code below, note the ws = new WebSocket(“ws://192.168.2.4:8888/ws”); in the code, this IP will vary depending on your network setup. I also just called the following file ‘t.html’, feel free to name it whatever you want. This file also goes in the RPi /var/www folder.